During their stay on the island, our passengers make the first stop at Oia where they get the chance to enjoy world-famous sites like the unique view from Kaldera, Oia’s commercial side, churches and traditional houses. 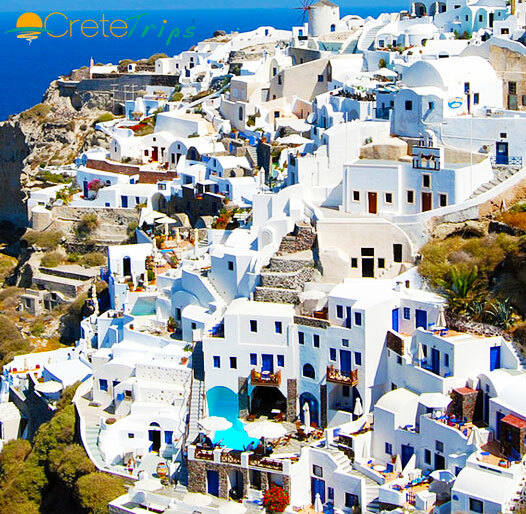 What follows is magnificent Fira, the capital of Santorini, for either one or three hours according to their tour of choice. Again, they have the chance to enjoy the view and Kaldera’s impressive rock cliffs. They can walk around picturesque village roads to explore the special beauty of this Cycladic island and cherish its traditional architecture and local market. Having concluded their visit to Fira passengers can either choose to remain in the beautiful capital of the island or visit the lovely seashore of Perissa with its black pebbles where they can spend about two hours. Please note that transportation to and from Rethymno Marina port is not included in the price. Transportation to Rethymno port and back to your hotel is available on extra charge. Passengers need to show their vouchers in order to get on the bus. Bus transfer is operated by IAKOVOS TRAVEL buses. When boarding the ship passengers need to show their printed vouchers in order to be given the issued ticket. Identification card is mandatory.